Novomatic has enormous success with slot machines. They are also well known for best remakes and reworks. If you already know the recipe for success and wish to create a new slot machine game you will most likely include all the previous elements that proven to be famous. Following this concept, Novomatic has released Sizzling Hot Quattro, a one of a kind slot, which essentially puts four Sizzling Hot Deluxe standalone parts on the same screen. All the fun from the deluxe version is channeled and amplified four times into the new Quattro version. Sounds great, at least in theory. Quattro simply means four in Italian. Naming it Sizzling Hot Quattro makes perfect sense since you are going to put 4 x Sizzling Hot machines into the same game. Poker players would be familiar with it as multi-tabling is frequent in online poker. There is no question, the game is good and has acquired a fan base pretty quickly, but we think it hasn't acquired the popularity it was designed for. Low value winning symbols are lemons, oranges, plums, and cherries. Higher value symbols are grapes, watermelons, and the stars. The highest win symbol and combination is the 77777 also called five red sevens or 5 sizzling sevens. The Sizzling Hot Quattro slot allows for significantly higher wins per spin than its classic counterparts. It is possible to get the highest winning combination in each of the four windows in the game. For example, on a 0.05 line bet and a total bet of 1 getting 5 of the red sevens rewards 500 per windows. Consider this, all four windows or tabs paying 500 for a total 2000 on just 1 total bet per spins. Isn't that simply incredible? The simple fact of getting 4x 77777 is a pretty rare and low chance event, so make sure to take a screenshot if it happens. The best way to understand how a game works is to play it. Go ahead and sign up below to play the original game. We recommend Quasar Gaming as they are licensed Novomatic, GreenTube vendors. Pick a seat and start playing. Initially, the player starts with 500 credits on the demo version of the game. The Paytable button offers important information regarding win symbol values and combinations. It's very useful to know that 2 cherries constitute a winning combination of the lowest kind. For all other symbols, 3 or more are necessary to form a winning combo. This also means cherries will be the most commonly seen win symbols in Quattro. Important! Multiple different winning combinations on different tabs are possible. Let me explain. For example, the first tab contains 3 lemons and the second tab 4 grapes. The third tab has 5 oranges and the fourth tab has 2 cherries. These winnings add up to a total. On a 1 total bet, the total winnings are worth 21.25. That's not all, Sizzling Hot Quattro lets the player double all winnings from all 4 tabs with the gamble feature. The gamble feature is simple and liked by many. The player must guess the color of a card, black or red. If the guess is correct the amount won is doubled and the process can be repeated more times. An incorrect guess terminates the process and returns the player to the spin phase. 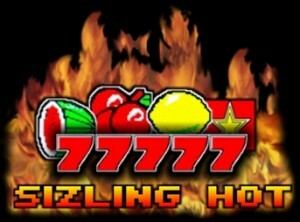 Being released in 2013, the Sizzling Hot Quattro slot has been growing strong. It is nowhere near close to the traditional version's popularity. Playing this slot gives the feeling that you are multi-tabling at a poker room.